I liked this book more than the first one. It was so emotionally powerful, and the characters developed well. Celaena Sardothien is the king’s Champion—yet she is far from loyal to the crown, for the man she serves is bent on evil. But working against her master in secret is no easy task. As Celaena tries to untangle the mysteries buried within the glass castle, she can trust no one, not even her supposed allies Crown Prince Dorian, Captain of the Guard Chaol, and foreign princess Nehemia. This book is not necessarily 100 times more amazing than the first book. The one marked difference is the fantasy elements, which felt extraneous and randomly inserted in to the first one. They really develop in this book and add to the story. Celaena’s character only becomes more complex. I loved the conflict of loyalties that being the King’s Champion presented, and the way the rest of the characters responded to her new position. As the book progresses, Celaena’s character gets darker and darker, giving the reader a window into who she was as Ardlan’s Assassin. Basically, I’m in love with Celaena. She’s a badass, but she also has a complex psyche. This book is also sadder than the first book. There were tears, not gonna lie. The romance is more developed, and the love triangle continues. The plot thickens, though it is clear that it is in build up to the third book. 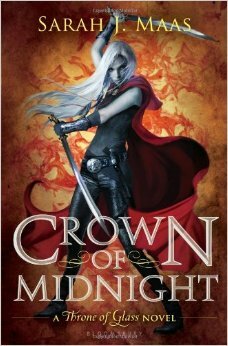 If you liked Throne of Glass, I would definitely recommend reading the rest of the series. So from this point on, THERE ARE SPOILERS!!!! I liked Chaol as a love interest, but I never really fell in love with him. I still like Dorian more. I didn’t really care when Celaena went “I’ll kill you” on him, to be honest. Dorian having magic definitely made the book better. It was the conflict his character needed to keep him interesting, and I’m pissed that even when Celaena found out about the magic, she didn’t tell him everything she knew about Wyrdkeys and his father’s magic. Princess Nehemia’s death felt unnecessary when it initially happened. It wasn’t until much farther into the book that I felt like the motivation behind her death made sense to me. Still, I feel like the same result could have been accomplished with less drastic measures. I loved seeing dark Celaena in response to Nehemia’s death. It was morbid, but it helped me understand her character during the rest of the series. Mort is my favorite character ever. Not really, the rest of them are great, but he was the dose of humor the book desperately needed. The tunnel under the library was interesting, but also a bit confusing. The creepy monster thing wasn’t significant until the third book. Actually, a lot of this book felt like the set up for the next book. I would have liked it if more things were explained in this installment, instead of left vague to be piece together in the third volume.